Library Booknotes "One of the Year's Best" 1998. Assuming a multitude of guises and functions, these intermediaries between God and humanity remain a source of endless fascination and speculation. An enlightening, comprehensive A-to-Z guide to angels of all kinds, The Encyclopedia of Angels, Second Edition provides a scholarly reference to the origins, natures, functions, and manifestations of angels. Sure to delight and inform students, scholars, and laypeople alike, this second edition is the definitive source on the subject. Carefully executed and extensive revisions cover 50 percent more material than the previous edition, adding unsurpassed detail and accuracy to an encyclopedia that is already impressive in scope and authority. Engaging, fact-filled entries cover topics such as the history of angelologies, individual angels, the importance of angels in major world religions, encounters with angels, and depiction of angels in art and popular culture. Several entries cover prominent historical figures, such as Charles Lindbergh, William Blake, and Carl Jung, who claimed to have experienced first-hand interaction with angels. In addition, many entries have been updated, rewritten, and expanded, particularly topical entries like those on drama, music, or film. The encyclopedia also contains an expanded bibliography and approximately 65 new illustrations, as well as a new introduction and a foreword written by Lisa Schwebel, Ph.D., Professor of Religion, Hunter College, City University of New York. Key figures such as theologians, philosophers, and mystics (Eleazar of Worms, St. Hildegard of Bingen, Meister Eckhardt, and others). "Although this volume will enable ready-reference questions on different angel names or angel orders or ministering angels, it also is a very readable book that could be part of the circulating as well as the reference collections of public libraries." 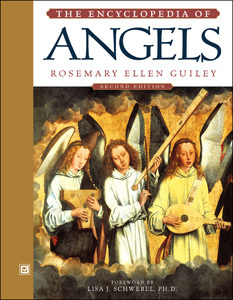 "...should satisfy the appetite of anyone fascinated with the history of angels...the 2nd [edition features] a considerable amount of new material...The reader will recognize [the author's] name and appreciate her scholarship and attention to detail and documentation."